The Kingsbarns Distillery and Visitor Centre, located in the East Neuk of Fife celebrated another momentous milestone as the copper pot whisky stills arrived at 09:00 this morning (Thursday 2 October). Both copper pot stills travelled from Rothes, Speyside and have been hand-made by Forsyths of Rothes. 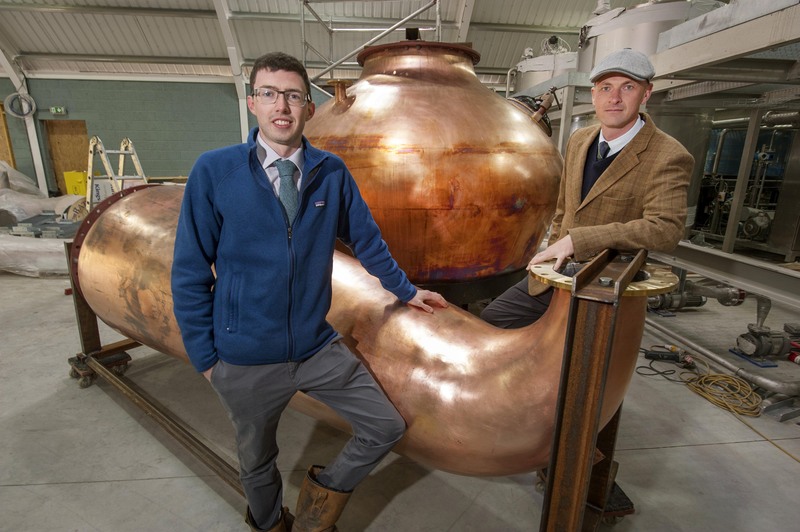 The Wash Still, weighing three and a half tonnes and holding 7,500 litres and the Spirit Still, weighing three tonnes and holding 4,500 litres will both play an integral part in determining the light character of spirit produced at Kingsbarns Distillery. “Our distillery and visitor centre has been a long time in the making, six years infact. It’s only been in the past two years, thanks to a Scottish Government grant and the backing of the Wemyss Family, one of Scotland’s oldest and most established family businesses, that has turned this dream into a reality. 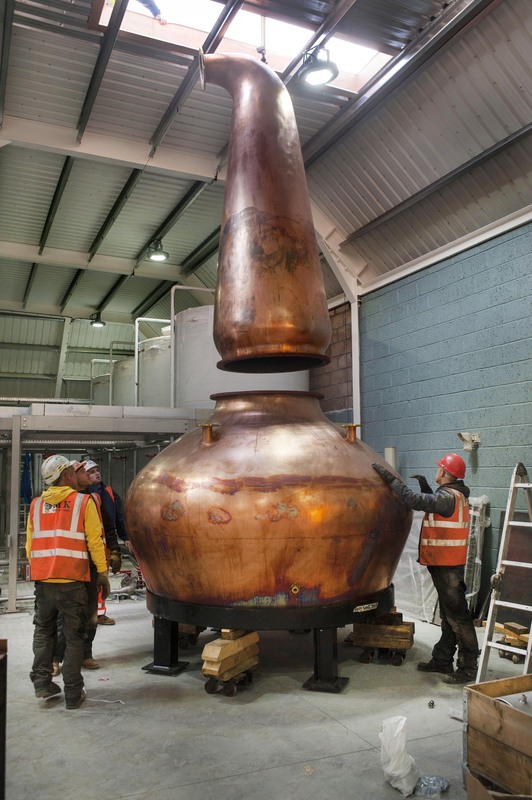 “Construction commenced Spring 2013 and today is hugely important in the development, with the final pieces of our distillery jigsaw, the copper pot stills, finally positioned in their new home”. 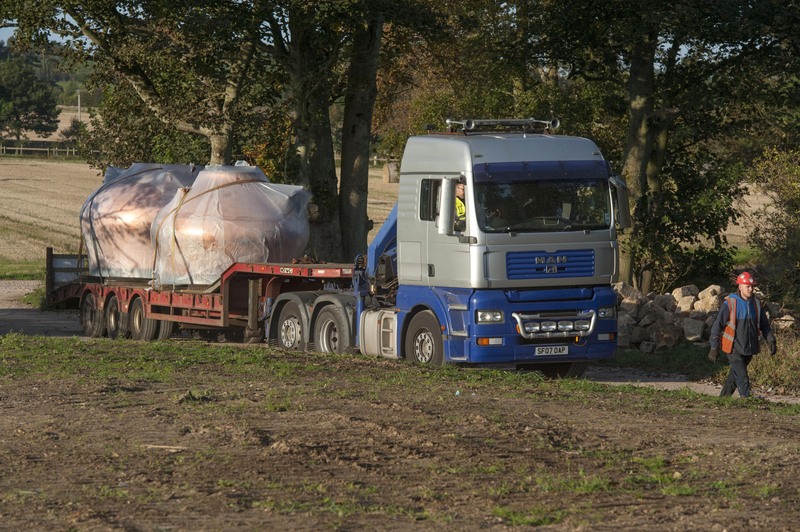 “Now that we have reached the important date of our copper pot stills arrival, we are well on our way to the final goal of producing Kingsbarns unique, light, Lowland spirit”. The Wemyss family bought the Kingsbarns Distillery project in January 2013 and construction at the site began at Easter that year. Approximately six miles from St. Andrews, the distillery and its visitor centre are being built close to the world famous Kingsbarns championship golf course on the Cambo Estate. The site of the actual distillery is the historic and charming East Newhall Farm steading. The new Kingsbarns Single Malt Scotch whisky will be classified in the Lowlands region and available after a minimum of three years maturation in oak casks. Fife grown malted barley has been secured to make the spirit and it will be matured predominantly in ex-Bourbon casks. Kingsbarns Distillery and Visitor Centre will open its doors to the public 1 December 2014.